Rheumatic fever is one of the complications associated with strep throat. It’s a relatively serious illness that can cause stroke, permanent damage to your heart, and death if it’s left untreated. Rheumatic fever can cause permanent damage to the heart, including damaged heart valves and heart failure. Treatments can reduce tissue damage from inflammation, lessen pain and other symptoms, and prevent the recurrence of rheumatic fever. Rheumatic fever symptoms may vary. Some people may have several symptoms, while others experience only a few. The symptoms may also change during the course of the disease. The onset of rheumatic fever usually occurs about two to four weeks after a strep throat infection. Also, see your doctor if your child shows any other signs or symptoms of rheumatic fever. Rheumatic fever can occur after an infection of the throat with a bacterium called Streptococcus pyogenes, or group A streptococcus. Group A streptococcus infections of the throat cause strep throat or, less commonly, scarlet fever. Group A streptococcus infections of the skin or other parts of the body rarely trigger rheumatic fever. The exact link between strep infection and rheumatic fever isn't clear, but it appears that the bacterium "plays tricks" on the immune system. The strep bacterium contains a protein similar to one found in certain tissues of the body. Therefore, immune system cells that would normally target the bacterium may treat the body's own tissues as if they were infectious agents — particularly tissues of the heart, joints, skin and central nervous system. This immune system reaction results in inflammation. If your child receives prompt and complete treatment with an antibiotic to eliminate strep bacteria — in other words, taking all doses of the medication as prescribed — there's little to no chance of developing rheumatic fever. If your child has one or more episodes of strep throat or scarlet fever that aren't treated or not treated completely, he or she may — but won't necessarily — develop rheumatic fever. Rheumatic fever (RF), also known as acute rheumatic fever (ARF), is an inflammatorydisease that can involve the heart, joints, skin, and brain. The disease typically develops two to four weeks after a throat infection. Signs and symptoms include fever, multiple painful joints, involuntary muscle movements, and occasionally a characteristic non-itchy rash known as erythema marginatum. The heart is involved in about half of cases. Permanent damage to the heart valves, known as rheumatic heart disease (RHD), usually only occurs after multiple attacks but may sometimes occur after a single case of ARF. The damaged valves may result in heart failure. The abnormal valves also increase the risk of the person developing atrial fibrillation and infection of the valves. Acute rheumatic fever may occur following an infection of the throat by the bacteriaStreptococcus pyogenes. If the infection is untreated rheumatic fever can occur in up to three percent of people. The underlying mechanism is believed to involve the production ofantibodies against a person's own tissues. Some people due to their genetics are more likely to get the disease when exposed to the bacteria than others. Other risk factors includemalnutrition and poverty. Diagnosis of ARF is often based on the presence of signs and symptoms in combination with evidence of a recent streptococcal infection. Treating people who have strep throat with antibiotics, such as penicillin, decreases their risk of getting ARF. This often involves testing people with sore throats for the infection, which may not be available in the developing world. Other preventative measures include improvedsanitation. In those with ARF and RHD prolonged periods of antibiotics are sometimes recommended. Gradual return to normal activities may occur following an attack. Once RHD develops, treatment is more difficult. Occasionally valve replacement surgery or repair is required. Otherwise complications are treated as per normal. Acute rheumatic fever occurs in about 325,000 children each year and about 18 million people currently have rheumatic heart disease. Those who get ARF are most often between the ages of 5 and 14, with 20% of first-time attacks occurring in adults. The disease is most common in the developing world and among indigenous peoples in the developed world. In 2013 it resulted in 275,000 deaths down from 374,000 deaths in 1990. Most deaths occur in the developing world where as many as 12.5% of people affected may die each year. Descriptions of the condition are believed to date back to at least the 5th century BCE in the writings of Hippocrates. The disease is so named because its symptoms are similar to those of some rheumatic disorders. A culture positive case ofstreptococcal pharyngitis with typical tonsillar exudate in a 16-year-old. The disease typically develops two to four weeks after a throat infection. Symptoms include: fever, multiple painful joints with the joints affected changing with time, involuntary muscle movements, and occasionally a characteristic non-itchy itchy rash known as erythema marginatum. The heart is involved in about half of cases. Permanent damage to the heart valves usually occurs only after multiple attacks but may occasionally occur after a single case of ARF. The damaged valves may result in heart failure. The abnormal valves also increase the risk of the person developing atrial fibrillation and infection of the valves. Micrograph showing an Aschoff body (right of image), as seen in rheumatic heart disease. H&E stain. Chronic rheumatic heart disease (RHD) is characterized by repeated inflammation with fibrinous repair. The cardinal anatomic changes of the valve include leaflet thickening, commissural fusion, and shortening and thickening of the tendinous cords. It is caused by an autoimmune reaction to Group A ?-hemolytic streptococci (GAS) that results in valvular damage. Fibrosis and scarring of valve leaflets, commissures and cusps leads to abnormalities that can result in valve stenosis or regurgitation. The inflammation caused by rheumatic fever, usually during childhood, is referred to as rheumatic valvulitis. About half of patients with acute rheumatic fever develop inflammation involving valvular endothelium. The majority of morbidity and mortality associated with rheumatic fever is caused by its destructive effects on cardiac valve tissue. The pathogenesis of RHD is complex and not fully understood, but it is known to involve molecular mimicry and genetic predisposition that lead to autoimmune reactions. Molecular mimicry occurs when epitopes are shared between host antigens and GAS antigens.This causes an autoimmune reaction against native tissues in the heart that are incorrectly recognized as "foreign" due to the cross-reactivity of antibodies generated as a result of epitope sharing. The valvular endothelium is a prominent site of lymphocyte-induced damage. CD4+ T cells are the major effectors of heart tissue autoimmune reactions in RHD. Normally, T cell activation is triggered by the presentation of GAS antigens. In RHD, molecular mimicry results in incorrect T cell activation, and these T lymphocytes can go on to activate B cells, which will begin to produce self-antigen-specific antibodies. This leads to an immune response attack mounted against tissues in the heart that have been misidentified as pathogens. Rheumatic valves display increased expression of VCAM-1, a protein that mediates the adhesion of lymphocytes. Self-antigen-specific antibodies generated via molecular mimicry between human proteins and GAS antigens up-regulate VCAM-1 after binding to the valvular endothelium. This leads to the inflammation and valve scarring observed in rheumatic valvulitis, mainly due to CD4+ T cell infiltration. While the mechanisms of genetic predisposition remain unclear, a few genetic factors have been found to increase susceptibility to autoimmune reactions in RHD. The dominant contributors are a component of MHC class II molecules, found on lymphocytes and antigen-presenting cells, specifically the DR and DQ alleles on human chromosome 6. Certain allele combinations appear to increase RHD autoimmune susceptibility. Human leukocyte antigen (HLA) class II allele DR7 (HLA-DR7) is most often associated with RHD, and its combination with certain DQ alleles is seemingly associated with the development of valvular lesions. The mechanism by which MHC class II molecules increase a host's susceptibility to autoimmune reactions in RHD is unknown, but it is likely related to the role HLA molecules play in presenting antigens to T cell receptors, thus triggering an immune response. Also found on human chromosome 6 is the cytokine TNF-? which is also associated with RHD. High expression levels of TNF-? may exacerbate valvular tissue inflammation, contributing to RHD pathogenesis. Mannose-binding lectin (MBL) is an inflammatory protein involved in pathogen recognition. Different variants of MBL2 gene regions are associated in RHD. RHD-induced mitral valve stenosis has been associated with MBL2 alleles encoding for high production of MBL. Aortic valve regurgitation in RHD patients has been associated with different MBL2 alleles that encode for low production of MBL. Other genes are also being investigated to better understand the complexity of autoimmune reactions that occur in RHD. Rheumatic heart disease at autopsywith characteristic findings (thickenedmitral valve, thickened chordae tendineae, hypertrophied left ventricularmyocardium). Modified Jones criteria were first published in 1944 by T. Duckett Jones, MD. They have been periodically revised by the American Heart Association in collaboration with other groups.According to revised Jones criteria, the diagnosis of rheumatic fever can be made when two of the major criteria, or one major criterion plus two minor criteria, are present along with evidence of streptococcal infection: elevated or rising antistreptolysin O titre or DNAase. Exceptions arechorea and indolent carditis, each of which by itself can indicate rheumatic fever. An April 2013 review article in the Indian Journal of Medical Research stated that echocardiographic and Doppler (E & D) studies, despite some reservations about their utility, have identified a massive burden of rheumatic heart disease, which suggests the inadequacy of the 1992 Jones' criteria. E & D studies have identified subclinical carditis in patients with acute rheumatic fever, as well as in follow-ups of rheumatic heart disease patients who initially presented as having isolated cases of Sydenham's chorea. Signs of a preceding streptococcal infection include: recent scarlet fever, raised antistreptolysin O or other streptococcal antibody titre, or positive throat culture. Polyarthritis: A temporary migrating inflammation of the large joints, usually starting in the legs and migrating upwards. Carditis: Inflammation of the heart muscle (myocarditis) which can manifest as congestive heart failure with shortness of breath,pericarditis with a rub, or a new heart murmur. Subcutaneous nodules: Painless, firm collections of collagen fibers over bones or tendons. They commonly appear on the back of the wrist, the outside elbow, and the front of the knees. 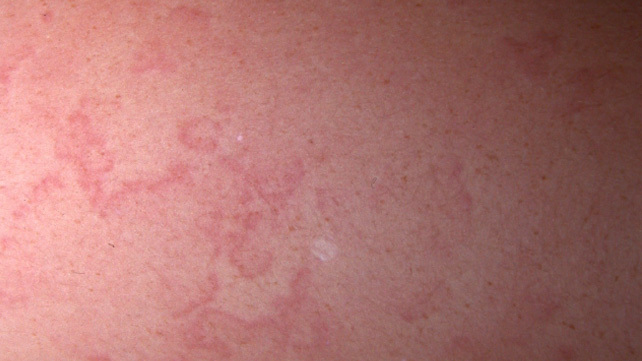 Erythema marginatum: A long-lasting reddish rash that begins on the trunk or arms as macules, which spread outward and clear in the middle to form rings, which continue to spread and coalesce with other rings, ultimately taking on a snake-like appearance. This rash typically spares the face and is made worse with heat. Sydenham's chorea (St. Vitus' dance): A characteristic series of rapid movements without purpose of the face and arms. This can occur very late in the disease for at least three months from onset of infection. Prevention of recurrence is achieved by eradicating the acute infection and prophylaxis with antibiotics. The American Heart Associationsuggests that dental health be maintained, and that people with a history of bacterial endocarditis, a heart transplant, artificial heart valves, or "some types of congenital heart defects" may wish to consider long-term antibiotic prophylaxis. The management of acute rheumatic fever is geared toward the reduction of inflammation with anti-inflammatory medications such asaspirin or corticosteroids. Individuals with positive cultures for strep throat should also be treated with antibiotics. Aspirin is the drug of choice and should be given at high doses of 100 mg/kg/day. One should watch for side effects like gastritis and salicylate poisoning. In children and teenagers, the use of aspirin and aspirin-containing products can be associated with Reye's syndrome, a serious and potentially deadly condition. The risks, benefits and alternative treatments must always be considered when administering aspirin and aspirin-containing products in children and teenagers. Ibuprofen for pain and discomfort and corticosteroids for moderate to severe inflammatory reactions manifested by rheumatic fever should be considered in children and teenagers. Steroids are reserved for cases where there is evidence of involvement of heart. The use of steroids may prevent further scarring of tissue and may prevent development of sequelae such as mitral stenosis. Monthly injections of longacting penicillin must be given for a period of five years in patients having one attack of rheumatic fever. If there is evidence of carditis, the length of therapy may be up to 40 years. Another important cornerstone in treating rheumatic fever includes the continual use of low-dose antibiotics (such as penicillin, sulfadiazine, or erythromycin) to prevent recurrence. No vaccines are currently available to protect against S. pyogenes infection, although there has been research into the development of one. Difficulties in developing a vaccine include the wide variety of strains of S. pyogenes present in the environment and the large amount of time and people that will be needed for appropriate trials for safety and efficacy of the vaccine. People with positive cultures for Streptococcus pyogenes should be treated with penicillin as long as allergy is not present. This treatment will not alter the course of the acute disease. The most appropriate treatment stated in the Oxford Handbook of Clinical Medicine for rheumatic fever is benzathine benzylpenicillin. While corticosteroids are often used, evidence to support this is poor. Salicylates are useful for pain. Some patients develop significant carditis which manifests as congestive heart failure. This requires the usual treatment for heart failure:ACE inhibitors, diuretics, beta blockers, and digoxin. Unlike normal heart failure, rheumatic heart failure responds well to corticosteroids.